An epic story of adventure, starring some of the most magnificent and courageous creatures alive, awaits you in EARTH. Disneynature brings you a remarkable story of three animal families on a journey across our planet -- polar bears, elephants and humpback whales. 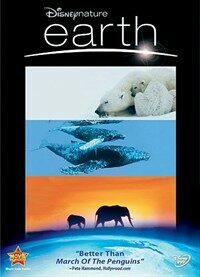 Filmed with spectacular clarity and beauty, EARTH is both majestic and intimate as it captures rare footage of nature's wildest and most elusive animals. From the landmark Disneynature collection, EARTH is an astonishing and heartwarming film filled with adventure, suspense and humor that will take your breath away.